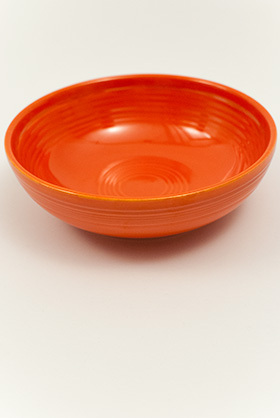 CIrca 1959-1969: Designed in 1939, but not produced for thirty years, the individual salad bowl with its abundance of inside, out and bottom rings is one of the nicest designed bowls in the Fiesta line. Many collectors of Homer Laughlin Pottery will recognize this bowl with the rings removed from the inside and produced as the Harlequin Individual Salad Bowl. It's amazing what all those extra rings can do to a design. The individual salad will easily become one of your favorite pieces. Produced in only four colors of Medium Green, Red, Yellow and Turquoise. 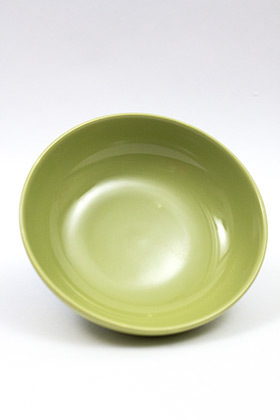 Circa 1959-1969: Designed in 1939, but not produced for thirty years, the individual salad bowl with its abundance of inside, out and bottom rings is one of the best designed bowls in the Fiesta line. 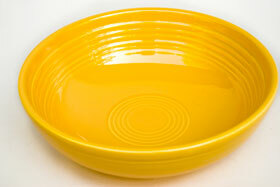 Circa 1959-1969: Vintage Fiesta Individual Salad Bowl. Introduced in 1959, the individual salad bowl has the distinction of being the first new item added to the line since 1940! Circa 1951-1959: Not many pieces of Harlequin pottery share as many traits with their Fiesta counterparts as does the Harlequin Individual Salad Bowl. Thick walled construction, bands of concentric rings and a wide, generous size unite this shape across both lines. 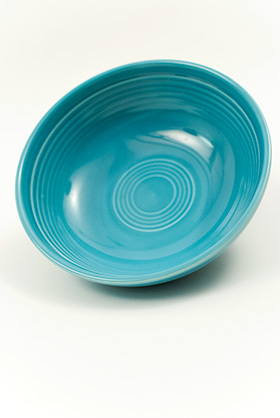 The Harlequin version will not have the inside rings and will, like all vintage Harlequin , be unmarked on the bottom. Generous in size at 7 12" wide. Circa 1959-1965: Not many pieces of Harlequin pottery share as many traits with their Fiesta counterparts as does the Harlequin Individual Salad Bowl. Thick walled construction, bands of concentric rings and a wide, generous size unite this shape across both lines. The Harlequin version will not have the inside rings and will, like all vintage Harlequin , be unmarked on the bottom. Made for only 6 years in Medium Green, this will undoubtedly be the hardest of the 12 colors to find. This example is from the Becky Turner Estate is the most pristine and perfect version of this piece I have ever seen. 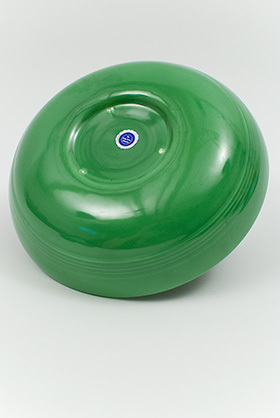 Here is a chance to acquire perhaps the best known example of this bowl possible.